Pearlharbor.org is an online service that enables users to research Pearl Harbor and book tour experiences. 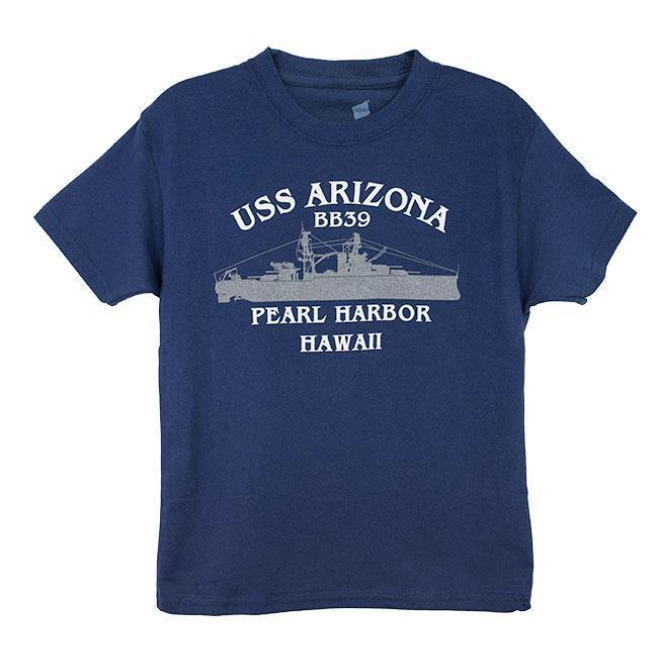 Pearlharbor.org offers a variety of tours, tickets and services (“products”) made available by third party suppliers through this and our affiliates’ websites and mobile properties and related applications (collectively, this “Website”). This Website is provided to assist customers in gathering historical as well as travel excursion information, posting opinions of travel excursions, and searching for and booking reservations for Products, and for no other purposes. The terms “we”, “us”, “our” and “PearlHarbor.org” refer to Holo Hawai‘i Tours, LLC, a Hawai‘i company, and/or our affiliates, parent company, and subsidiaries. The term “you” refers to the customer visiting the Website and/or contributing content on this Website. This Website and the Products made available on this Website are offered to you conditioned upon your acceptance without modification of any/all the terms, conditions, and notices set forth below (collectively, the “Agreement”). By accessing or using this Website in any manner, you agree to be bound by the Agreement and represent that you have read and understood its terms. Please read the Agreement carefully, as it contains information concerning your legal rights and limitations on these rights, as well as a section regarding applicable law and jurisdiction of disputes. If you do not accept all of these terms and conditions, please do not use this Website or book a Product. In all booking arrangements, the person making the booking shall be deemed to have accepted this Agreement on behalf of the persons named in the booking. We may change or otherwise modify the Agreement in the future, and you understand and agree that your continued access or use of this Website after such change signifies your acceptance of the updated or modified Agreement. We will note the date that revisions were last made to the Agreement at the top of this page, and any revisions will take effect upon posting. We will notify our members of material changes to these terms and conditions by either sending a notice to the email address provided to us at registration or by placing a notice on our Website. Be sure to return to this page periodically to review the most current version of the Agreement. By using this website, you accept these terms and conditions in full. If you disagree with any part of these terms and conditions, you must not use this website. As a condition of your use of this Website, you warrant that (i) all information supplied by you on this Website is true, accurate, current and complete, (ii) if you have a PearlHarbor.org account, you will safeguard your account information and will supervise and be completely responsible for any use of your account by anyone other than you and (iii) you are 13 years of age or older in order to register for an account and contribute to our Website. We do not knowingly collect the information of anyone under the age of 13. Your use of this Website is intended for personal, noncommercial use and/or to make legitimate requests to book the Products offered. You agree not to use this Website to make any speculative, false or fraudulent requests. You further represent and warrant that you (a) have not previously been suspended by Holo Hawai‘i Tours or otherwise banned from using the Website; (b) are not a direct competitor of Holo Hawai‘i Tours; (c) you will not have more than one PearlHarbor.org account at any given time; and (d) that you have full power and authority to enter into this Agreement and in doing so will not violate any other agreement to which you are a party. We retain the right at our sole discretion to deny access to anyone to this Website and the services we offer, at any time and for any reason, including, but not limited to, for violation of this Agreement. In accessing or using the Website, you may be exposed to content that is offensive, indecent, inaccurate, objectionable, or otherwise inappropriate. Pearlharbor.org does not endorse such content, and cannot vouch for its accuracy. You therefore access and use the Website at your own risk. Unless otherwise stated, Pearlharbor.org and/or its licensors own the intellectual property rights in the website and material on the website. Subject to the license below, all these intellectual property rights are reserved. Each product on this website has a cancellation policy that is explained in a tab on the product’s page. Changes and cancellations are allowed up to 17:00 local time, 3 business days prior to the activity. Any cancellations made after 17:00 local time, 3 business days prior to the activity will be subject to a charge of 100% of the total amount. Groups of 8 or more may make changes and cancellations up to 17:00 local time, 7 business days prior to the activity. Cancellations made later are subject to a 100% charge. Changes and cancellations on private tours may be made up to 17:00 local time, 15 business days prior to the activity. Cancellations made later are subject to a 100% charge. 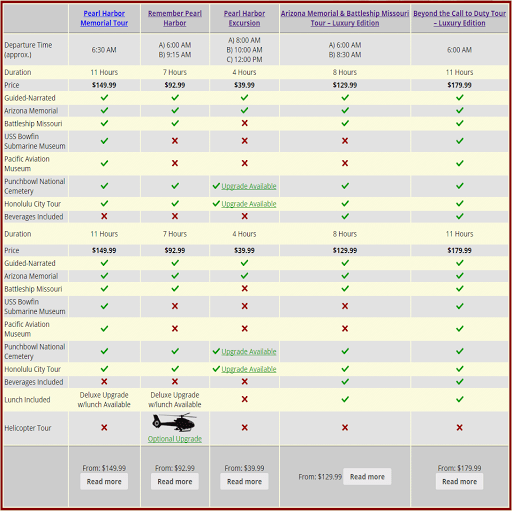 Tours that include airfare are non-refundable. Airfare is not transferable and not changeable. Although flights are non-refundable, non-transferable, and non-changeable, please give us notice as soon as you know that you will not be able to go on the tour and we will try to work with our airline partners to reschedule you. While this has happened, it is not a guarantee. By using this website, you agree that Pearlharbor.org is not guaranteeing availability of tickets at the time of purchase. Pearlharbor.org reserves the right to schedule tours with vendors and contractors. The tour and transportation vendors will possess Commercial Use Authorization to operate at Pearl Harbor. There are occasions (a few times per year) that the boats do not visit the Arizona Memorial. This can happen as a result of weather conditions, boat mechanical problems, or safety issues at the memorial. If we know in advance that this is happening, then we will do our best to notify you before your tour. The movie at the Pearl Harbor Visitors Center, the boat to the Arizona Memorial, the Arizona Memorial, and the Pearl Harbor Visitors Center are all out of our control. If there is a closure for safety, weather, mechanical or other causes, tours that have already departed are not eligible for refunds. Tour companies do not provide refunds if the Navy boats do not take guests to the Arizona Memorial. It is out of the control of tour companies that have already provided transportation. Sometimes during closures that are not related to wind or boat maintenance, the boats will go near the memorial, but not board the memorial. in these cases, guests may still board boats to the memorial and float past it. They will also be able to see battleship’s remnants. But they won’t be able to disembark the boats and walk on the memorial. Tours include transportation from the locations mentioned on the tour page. Tours cannot be arranged to meet at Pearl Harbor. If you do not specify a hotel or pick-up location in your reservation request, a default location may be assigned. It is your responsibility to be at the Pick-up location at the time specified on the confirmation email. If, for any reason, you do not receive the confirmation email, please contact us here https://pearlharbor.org/faqs/where-is-my-confirmation/ or call us at 808.626.5366. If you do not contact us to request a confirmation email, it will be assumed that you have received it and you will be responsible for being at the pick-up location at the specified time. Prices listed on the Website are per person, unless otherwise specified. Prices are based on the local tariff at the time of quoting, converted at the prevailing foreign-exchange rate as determined by Stripe. Unless otherwise specified, prices do not include any local taxes or use-fees, including harbor fee or booking fees. Prices do not include tips/gratuities to tour directors, drivers or local guides; passport and visa fees; baggage and personal insurance; any items of a personal nature; taxes or duties; and any beverages or food not specifically listed under “Inclusions” on the product pages of the Website. You grant to Pearlharbor.org a worldwide, irrevocable, non-exclusive, royalty-free license to use, reproduce, adapt, publish, translate and distribute your user content in any existing or future media. You also grant to Pearlharbor.org the right to sub-license these rights, and the right to bring an action for infringement of these rights. Your user content must not be illegal or unlawful, must not infringe any third party’s legal rights, and must not be capable of giving rise to legal action whether against you or Pearlharbor.org or a third party (in each case under any applicable law). Pearlharbor.org reserves the right to edit or remove any material submitted to this website, or stored on Pearlharbor.org’s servers, or hosted or published upon this website. Notwithstanding Pearlharbor.org’s rights under these terms and conditions in relation to user content, Pearlharbor.org does not undertake to monitor the submission of such content to, or the publication of such content on, this website. This website is provided “as is” without any representations or warranties, express or implied. Pearlharbor.org makes no representations or warranties in relation to this website or the information and materials provided on this website. These limitations of liability apply even if Pearlharbor.org has been expressly advised of the potential loss. PLEASE READ THIS SECTION CAREFULLY. THIS SECTION LIMITS HOLO HAWAII TOUR’S LIABILITY TO YOU FOR ISSUES THAT MAY ARISE IN CONNECTION WITH YOUR USE OF THIS WEBSITE. IF YOU DO NOT UNDERSTAND THE TERMS IN THIS SECTION OR ELSEWHERE IN THE AGREEMENT, PLEASE CONSULT A LAWYER FOR CLARIFICATION BEFORE ACCESSING OR USING THIS WEBSITE. THE INFORMATION, CONTENT, SOFTWARE, PRODUCTS, AND SERVICES PUBLISHED ON THIS WEBSITE MAY INCLUDE INACCURACIES OR ERRORS, INCLUDING RESERVATION AVAILABILITY AND PRICING ERRORS. HOLO HAWAII TOURS LLC, ITS PARENT, SUBSIDIARIES AND CORPORATE AFFILIATES (COLLECTIVELY, THE “HOLO HAWAII TOURS”) DO NOT GUARANTEE THE ACCURACY OF, AND DISCLAIM ALL LIABILITY FOR, ANY ERRORS OR OTHER INACCURACIES RELATING TO THE INFORMATION AND DESCRIPTION OF THE PRODUCTS AND SERVICES DISPLAYED ON THIS WEBSITE (INCLUDING, WITHOUT LIMITATION, THE PRICING, AVAILABILITY, PHOTOGRAPHS, FEATURES, INCLUSIONS AND EXCLUSIONS, GENERAL PRODUCT DESCRIPTIONS, REVIEWS AND RATINGS, ETC.). IN ADDITION, HOLO HAWAII TOURS EXPRESSLY RESERVES THE RIGHT TO CORRECT ANY AVAILABILITY AND PRICING ERRORS ON OUR WEBSITE AND/OR ON PENDING RESERVATIONS MADE UNDER AN INCORRECT PRICE. HOLO HAWAII TOURS MAKE NO REPRESENTATIONS ABOUT THE SUITABILITY OF THE INFORMATION, CONTENT, SOFTWARE, PRODUCTS, AND SERVICES CONTAINED ON THIS WEBSITE FOR ANY PURPOSE, AND THE INCLUSION OR OFFERING OF ANY PRODUCTS OR SERVICES ON THIS WEBSITE DOES NOT CONSTITUTE ANY ENDORSEMENT OR RECOMMENDATION OF SUCH PRODUCTS OR SERVICES BY HOLO HAWAII TOURS. ALL SUCH INFORMATION, CONTENT, SOFTWARE, PRODUCTS, AND SERVICES ARE PROVIDED “AS IS” WITHOUT WARRANTY OF ANY KIND. HOLO HAWAII TOURS DISCLAIM ALL WARRANTIES AND CONDITIONS THAT THIS WEBSITE, ITS SERVERS OR ANY EMAIL SENT FROM HOLO HAWAII TOURS, ARE FREE OF VIRUSES OR OTHER HARMFUL COMPONENTS. HOLO HAWAII TOURS HEREBY DISCLAIMS ALL WARRANTIES AND CONDITIONS WITH REGARD TO THIS INFORMATION, CONTENT SOFTWARE, PRODUCTS, AND SERVICES, INCLUDING ALL IMPLIED WARRANTIES AND CONDITIONS OF MERCHANTABILITY, FITNESS FOR A PARTICULAR PURPOSE, TITLE, AND NONINFRINGEMENT, TO THE EXTENT PERMITTED BY LAW. THE THIRD-PARTY SUPPLIERS AND PRIVATE TOUR GUIDES PROVIDING PRODUCTS OR OTHER SERVICES ON THIS WEBSITE ARE INDEPENDENT CONTRACTORS AND NOT AGENTS OR EMPLOYEES OF HOLO HAWAII TOURS. HOLO HAWAII TOURS ARE NOT LIABLE FOR THE ACTS, ERRORS, OMISSIONS, REPRESENTATIONS, WARRANTIES, BREACHES, NEGLIGENCE OR MISCONDUCT OF ANY SUCH SUPPLIERS OR PRIVATE TOUR GUIDES OR FOR ANY PERSONAL INJURIES, DEATH, PROPERTY DAMAGE, OR OTHER DAMAGES OR EXPENSES RESULTING THEREFROM OR OTHERWISE ARISING FROM YOUR BOOKING OF A PRODUCT OR SERVICE OR YOUR USE OF A PRODUCT OR SERVICE. HOLO HAWAII TOURS HAVE NO LIABILITY AND WILL MAKE NO REFUND IN THE EVENT OF ANY DELAY, CANCELLATION, OVERBOOKING, STRIKE, FORCE MAJEURE OR OTHER CAUSES BEYOND THEIR DIRECT CONTROL, AND THEY HAVE NO RESPONSIBILITY FOR ANY ADDITIONAL EXPENSE, OMISSIONS, DELAYS, RE-ROUTING OR ACTS OF ANY GOVERNMENT OR AUTHORITY. IN NO EVENT SHALL HOLO HAWAII TOURS (OR THEIR OFFICERS, DIRECTORS AND AFFILIATES) BE LIABLE FOR ANY DIRECT, INDIRECT, PUNITIVE, INCIDENTAL, SPECIAL, EXEMPLARY OR CONSEQUENTIAL DAMAGES (INCLUDING WITHOUT LIMITATION LOSS OF DATA OR INFORMATION OR COSTS TO PROCURE SUBSTITUTE GOODS OR SERVICES) ARISING OUT OF, OR IN ANY WAY CONNECTED WITH, PRODUCT OR SERVICE BOOKINGS MADE BY YOU THROUGH THIS WEBSITE OR YOUR ACCESS TO, DISPLAY OF OR USE OF THIS WEBSITE OR WITH THE DELAY OR INABILITY TO ACCESS, DISPLAY OR USE THIS WEBSITE (INCLUDING, BUT NOT LIMITED TO, YOUR RELIANCE UPON REVIEWS AND OPINIONS APPEARING ON THIS WEBSITE; ANY COMPUTER VIRUSES, INFORMATION, SOFTWARE, LINKED SITES, PRODUCTS, AND SERVICES OBTAINED THROUGH THIS WEBSITE; OR OTHERWISE ARISING OUT OF THE ACCESS TO, DISPLAY OF OR USE OF THIS WEBSITE) WHETHER BASED ON A THEORY OF NEGLIGENCE, CONTRACT, TORT, STRICT LIABILITY, OR OTHERWISE, AND EVEN IF HOLO HAWAII TOURS HAS BEEN ADVISED OF THE POSSIBILITY OF SUCH DAMAGES. If Holo Hawai‘i Tours is found liable for any loss or damage that arises out of or is in any way connected with your use of our Websites or your booking or use of Products or services made available through our Website, then Holo Hawai‘i Tours’ liabilities will in no event exceed, in the aggregate, the greater of (a) the transaction fees paid to us for the transaction(s) on this Website giving rise to the claim, or (b) One-Hundred Dollars (US $100.00). The limitation of liability reflects the allocation of risk between the parties. The limitations specified in this section will survive and apply even if any limited remedy specified in these terms is found to have failed of its essential purpose. The limitations of liability provided in these terms inure to the benefit of Holo Hawai‘i Tours. matter which it would be illegal or unlawful for Pearlharbor.org to exclude or limit, or to attempt or purport to exclude or limit, its liability. You hereby indemnify Pearlharbor.org and undertake to keep Pearlharbor.org indemnified against any losses, damages, costs, liabilities and expenses (including without limitation legal expenses and any amounts paid by Pearlharbor.org to a third party in settlement of a claim or dispute on the advice of Pearlharbor.org’s legal advisers) incurred or suffered by Pearlharbor.org arising out of any breach by you of any provision of these terms and conditions, or arising out of any claim that you have breached any provision of these terms and conditions. Without prejudice to Pearlharbor.org’s other rights under these terms and conditions, if you breach these terms and conditions in any way, Pearlharbor.org may take such action as Pearlharbor.org deems appropriate to deal with the breach, including suspending your access to the website, prohibiting you from accessing the website, blocking computers using your IP address from accessing the website, contacting your internet service provider to request that they block your access to the website and/or bringing court proceedings against you. Pearlharbor.org may revise these terms and conditions from time-to-time. Revised terms and conditions will apply to the use of this website from the date of the publication of the revised terms and conditions on this website. Please check this page regularly to ensure you are familiar with the current version. Pearlharbor.org may transfer, sub-contract or otherwise deal with Pearlharbor.org’s rights and/or obligations under these terms and conditions without notifying you or obtaining your consent. These terms and conditions will be governed by and construed in accordance with Hawaii Law, and any disputes relating to these terms and conditions will be subject to the exclusive jurisdiction of the courts of Honolulu, Hawaii. For answers to your questions or ways to contact us, visit our contact page.